This plan was up and running before, I don’t know why they stopped it, but the good news is that Glo 4X recharge is back. Glo 4X recharge offers you 4 times the value of your recharge in bonuses when you dial the below code. When you Recharge your Glo lines by dialing *323*PIN# OR top up electronically with any of the following amounts: N150, N250, N550, N1050, N2050, N5050 and N10,050. The Glo 4X recharge bonus can be used to call all networks in Nigeria, browse, send SMS and call 24 international destinations. 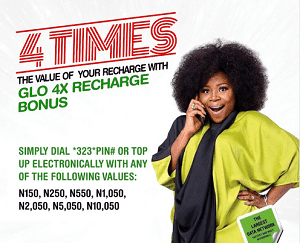 How to Check Your Glo 4X Recharge bonus?